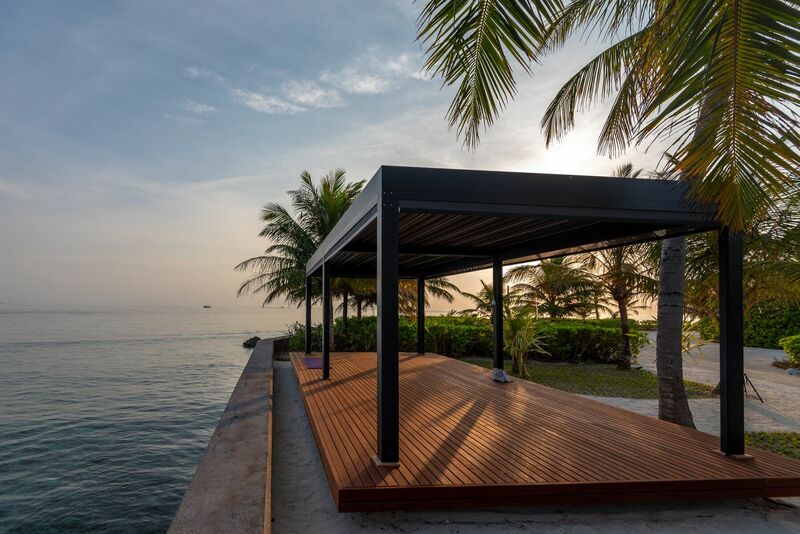 After a couple of years doing yoga at the water sports recreation jetty, sharing a bit of fun before people set off on their snorkelling trip, while trying your best to stay focused on your breath for your practice, we thought we could uplift the experience to a more “Zen” environment. We wanted you to find the spot on the island where you could stay effortlessly centred on yourself. It was still wonderful to have such a place for a yoga class compared to a regular classroom. 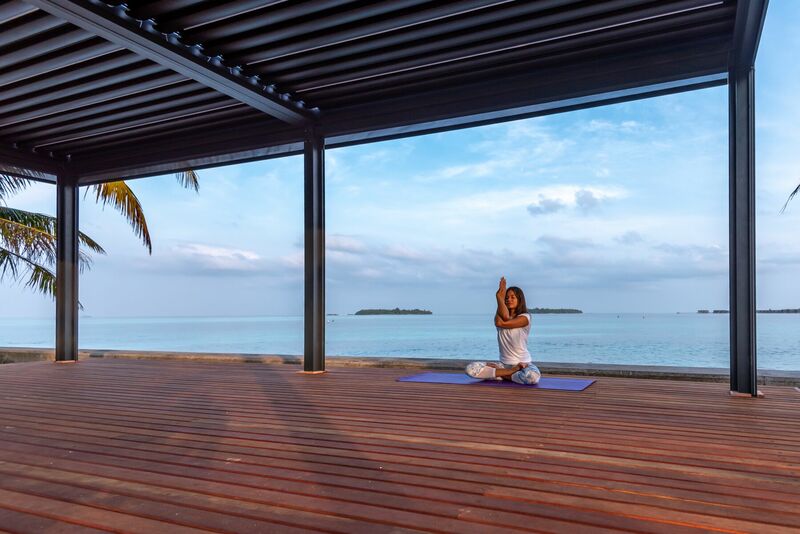 After thinking that every single person should have their happy holiday, we have finally built the perfect yoga spot for you!! 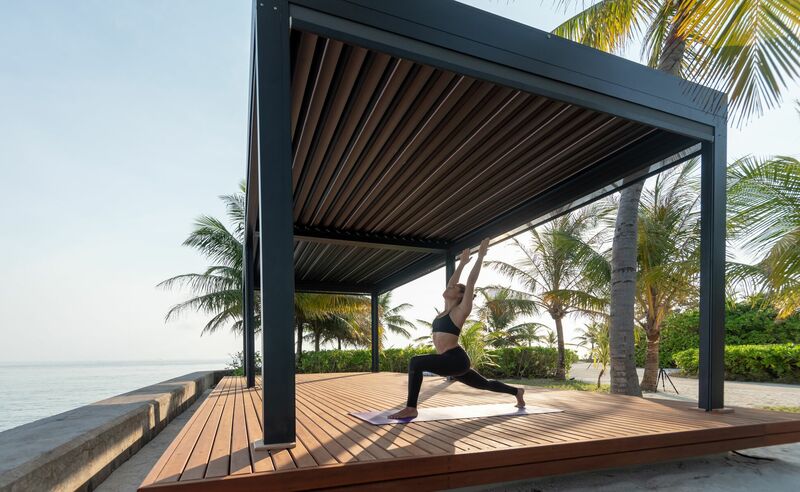 Kandooma now has a brand new yoga pavillion which will make your yoga experience even more unique!! Tranquility, the soothing sound of the waves in the gentle breeze, the palm trees and the astonishing views are ideal for anyone seeking to stay healthy and energized. With the goal of promoting wellness and healthier activities even on holiday. At the end of the day, apart from being a trend, it is something every single person is looking for – the feel good factor! 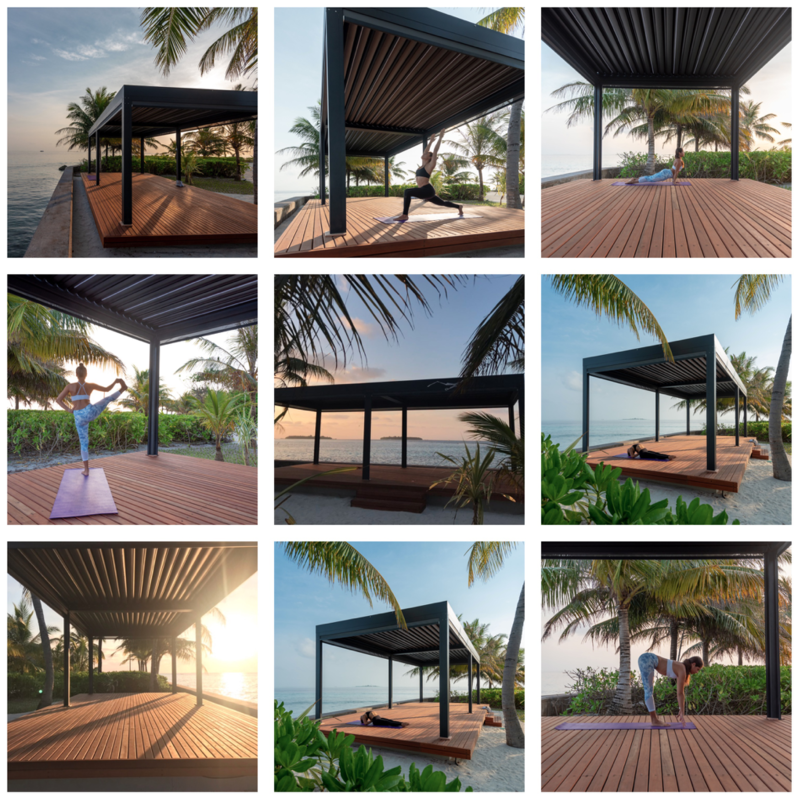 While in Kandooma you will be able to enjoy beautiful sunsets, start your mornings with a sun salutation practice or just meditate to have a clear mind for the rest of the day. 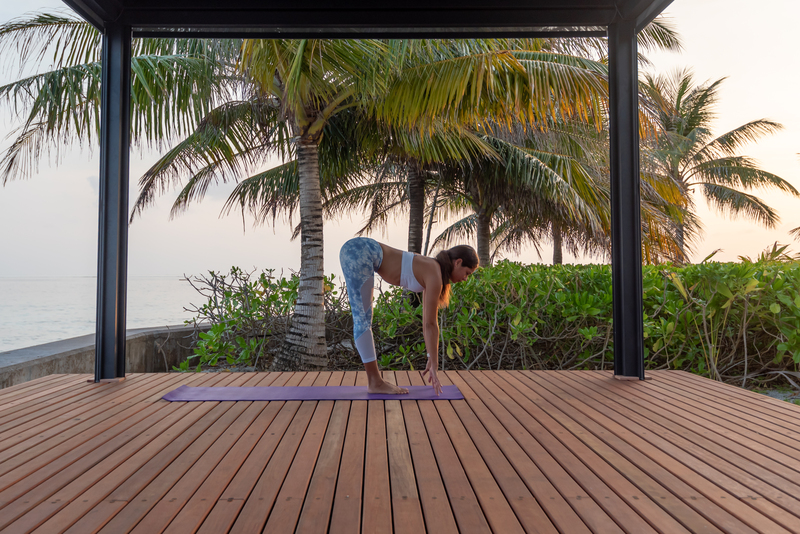 Whether you are a yogi, a surfer or just a wellbeing kind of person you will find your perfect yoga flow. It is never too late to try something new. In case you have no idea what yoga is about, here is a brief description. 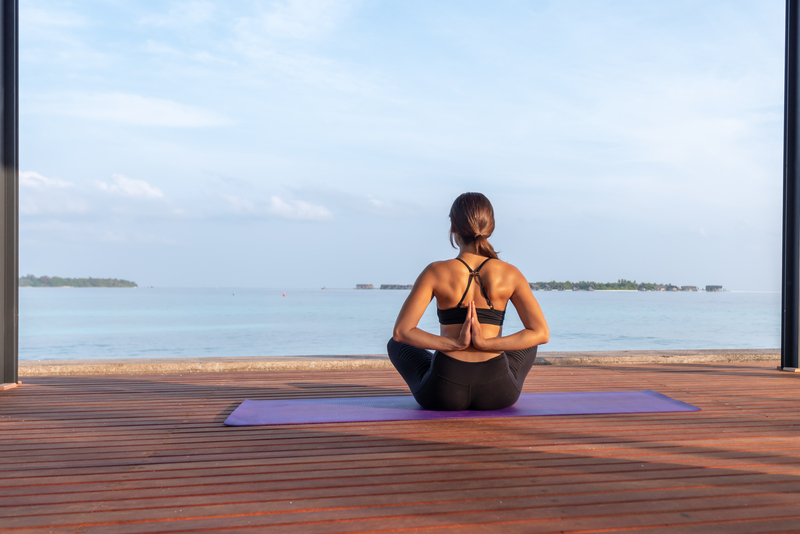 Yoga allows you to connect your body, mind and spirit to make better decisions, release tension and detoxify yourself while many more benefits through different postures. Yoga is becoming more popularnowadays and the reasons are clear. You can approach it the way you want. As an exercise, as a spiritual journey or as person who follows a natural lifestyle. For some reason, most people believe they need to be flexible and strong to be able to practise yoga, but it is actually the opposite!! You only become stronger and more flexible after a couple of classes. It’s not for everyone, but definitely worth trying. My first few classes were all about the lightness of my body afterwards. I can assure you of a great night’s sleep even if you just come for one session. Don’t worry if you are an extremely active person – we can give you a POWER YOGA class too – it just depends on what suits you personally. The pavilion is breathtaking!!! Start your wellness journey at Kandooma and this will undoubtedly help you to build up a habit. Go on, give it a go TODAY! !